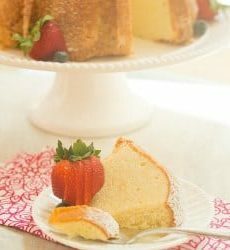 A simple and utterly delicious cream cheese pound cake. Perfect for just about any occasion! Preheat oven to 325 degrees F. Grease and flour a standard-size 12-cup Bundt pan. Using an electric mixer, beat the cream cheese and butter on medium speed until combined and soft, about 2 minutes. Add the sugar continue to beat on medium speed, scraping the bowl once or twice, until the mixture is very light and fluffy, about 5 minutes. Add the eggs one at a time, beating until each one is completely incorporated before adding the next. Scrape down the sides of the bowl, reduce the speed to low, and gradually add the flour until it has all been combined. Add the vanilla extract and salt and mix on low speed until incorporated, about 1 minute. Spoon the batter into the prepared pan and gently spread to the edges of the pan in an even layer. Bake for 1¼ to 1½ hours, or until a thin knife inserted into the center of the cake comes out clean. Allow the cake to cool in the pan for 15 minutes, then turn it out onto a wire cooling rack and allow to cool completely before serving. Leftovers can be wrapped in plastic wrap or placed in an airtight container and stored at room temperature for up to 4 days, or in the refrigerator for up to 1 week.